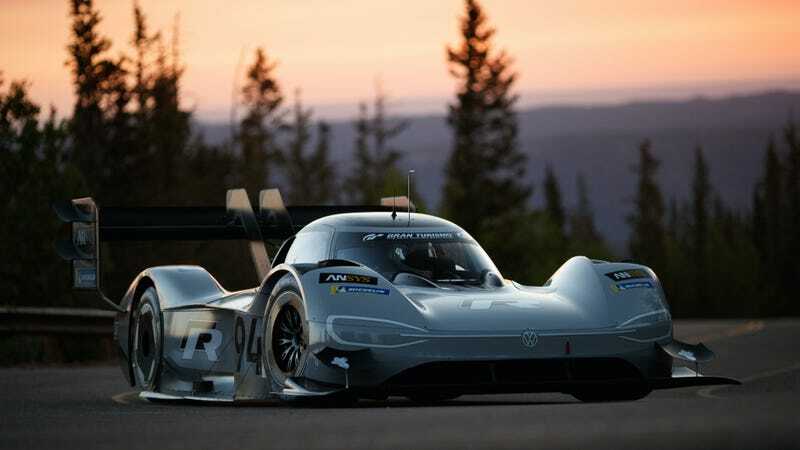 Volkswagen’s all-electric ID.R was built with the sole purpose of smashing records in mind. This streamlined downforce monster is ready to rip up almost any track or hillclimb known to man. It already owns the Pikes Peak record outright, and we’ve heard it’s going to attack the Nurburgring record this summer. It would seem that Volkswagen is following up a ring record—attempt, anyway—by heading to China for its next big climb record, up a public road, once again with ace racer Romain Dumas at the wheel. So what road are they going to race on? Oh, just this one. That road, called the “Heaven’s Gate” road, is a 6.8 mile ribbony sinew of steep and winding two-lane made up of several short straights and exactly 99 corners. It winds from about 650 feet above sea level up to 4,265 feet at the peak of the road up Tianamen Mountain. While there is no official lap time to beat, Land Rover placed the keys to a Range Rover Sport SVR (below) in the hands of racer Ho Pin Tung, who left-foot-braked his way to a best time of 9:51. While mighty impressive for the big SUV, the electric Volkswagen should have no trouble beating such a time. Volkswagen is actually looking to beat a more representative time, and will bring the competition to the masses. The German carmaker will painstakingly recreate the road in a virtual space and allow gamers to try their collective hands at setting the pace for Dumas to beat. Knowing the competitive level of online gaming these days, this may be Volkswagen’s most difficult record yet.